Founded 2003 in Atlanta GA, Tin Drum Asian Kitchen focuses on made by order cuisine from many Asian regions . Inspired by music and life around Asian curbside cafes, the menu packs bold flavors dishes prepared in open kitchen. The space invites all budgets, taste buds and styles, and looks to introduce guests with thoughtful, modern design and surprising, witty details. Our global economy has opened up vast new opportunities, especially in what we're eating now. 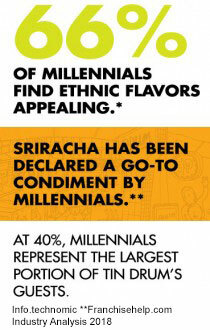 And the flavor profiles of Asia are leading the way. Tin Drum® Asian Kitchen serves up fresh, cooked-to-order wok dishes in a fun, fast casual atmosphere everyone--especially Snake People--loves. 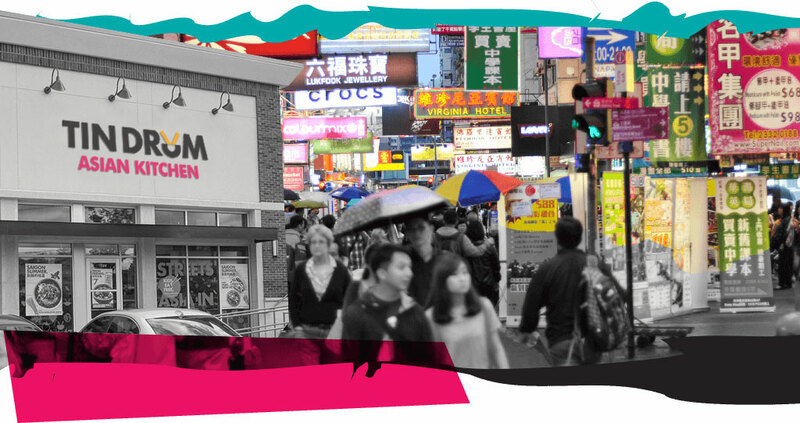 Tin Drum Asian Kitchens are inspired by the energy and atmosphere of the streets of Asia. Founder, Steven Chan, began Tin Drum in 2003 to bring people from all walks of life together to share in a meal that was both tantalizing and comforting. Tin Drum's are typically between 1,800 and 2,200 square feet and feature a dramatic wok theater, bold colors and images, and open shelving stocked, market-style, with noodles, sauces, and other ingredients used in cooking. Some locations also include a small set of retail product offerings featuring a variety of cool, exotic, and unique items from around the world. Tin Drum offers sit-down dining and takeout, with 60% of the business in lunch and 40% in dinner. Tin Drum's open theatre-style kitchen invites customers to experience the excitement of real wok cooking. Tin Drum serves Asia's greatest hits, made fresh and can be customized with different spices and levels of heat. Tin Drum Franchise Owners become the face of the brand for their customers and their community. Franchise Owners receive comprehensive training and ongoing support from experts in the fast casual franchise restaurant category. Tin Drum Asian Kitchen is looking for people who want to get in on the next big thing in global dining. Our Franchise Owners are driven to succeed, prefer Asian flavors that are big and bold, and are looking to capitalize on the huge demand for fun, fast casual restaurant concepts. PROSPERITY IS FOR THOSE WHO MARCH TO THE BEAT OF THEIR OWN DRUM. 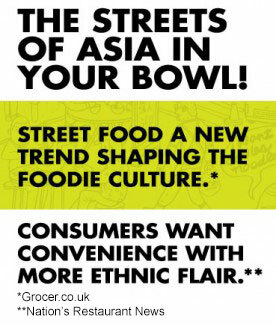 The Streets Of Asia In Your Bowl!! Follow The Tin Drum Ten Step Path To Becoming A Franchise Owner. Use the "inquire online" link above or below to receive further information and a team member will contact you to answer further questions. Non-committal but required for consideration. We will issue you a current copy of our Franchise Disclosure Document (FDD) as well as contact information for our franchisees to conduct further due diligence. Ask lots of questions! Meet or conference with our Director of Business Development to review FDD related or other outstanding questions. Find the heartbeat of Tin Drum. A team member will guide you on a tour of various Atlanta based locations. An opportunity to meet various executive staff members including founder, Steven Chan. Do we drum to the same beat? Franchisor will carefully review and determine if a franchise will be granted. If so, single or multi-unit agreements will be reviewed and executed. You are now a Tin Drum Asian Kitchen franchise business owner! Find a great location to drum up some business. Introductions to our real estate partners in the chosen market will be made. Secure your location. Franchisor will review your proposed site for approval. Execute your lease on an approved site. Our team will provide the needed specs, information, and guidance throughout the construction of your new Tin Drum Asian Kitchen. Get schooled by master drummers! Key manuals and measure will be provided during our intensive in-store training program and through the initial opening of your business. Let's drum up some business! Grand opening marketing guidance will be determined and executed in tandem with our team members support through the initial opening of your business. "You're in Business! The Tin Drum Ten Step is Complete but the Support From Our Team Continues On!" Looking for more information about Tin Drum Asiacafe? Take a moment to fill out our quick information request form.